From: "Todd Wilbur Reveals the Secrets to Great Restaurant Dishes"
2. Combine Bisquick with cold butter in a medium bowl using a pastry cutter or a large fork. You don't want to mix too thoroughly. There should be small chunks of butter in there that are about the size of peas. Add cheddar cheese, milk, and ¼ teaspoon garlic. Mix by hand until combined, but don't over mix. Plus 81 othersFrom around the world! 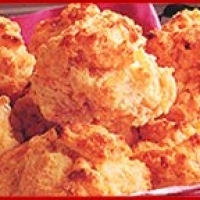 See Copycat Red Lobsters Cheddar Cheese Biscuits for extended comments. Almost perfect - they use fresh parsley, not dried flakes. Everyone in my family just raves about these bisquits. Love 'em! I saved this one! Thanks Jen for mentioning this in the "I Made It" group! I made these tonight and they turned out great! The kids loved them. They taste better than the ones at Red Lobster! I followed the recipe exactly. OOOOO wee, GIRL! LOVE THESE! We pray that there will be a long wait at Red Lobster when we go for Morgan's birthday dinner, just so we can get "extra" of these!!! We always do anyway! Aren't they great.... I posted close to the same one. We enjoy this recipe with soups. Thanks for adding it to the site.